Tokyo, October, 1964: Four of America’s top hopes for medals in the track and field events pose after arriving in Tokyo for the start of the 1964 Olympic Games. From left to right, they are Bob Hayes, Ralph Boston, Henry Carr and Fred Hansen. For every Olympics since the re-boot of the Olympic Games at Athens in 1896, Americans had won every single pole vault competition. 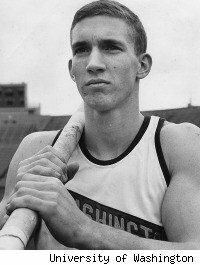 At the 1964 Tokyo Olympics, Fred Hansen of Cuero, Texas was the world record holder and favorite to be the 15th American Olympic pole vault champion in a row. But that streak was at risk late into the evening of October 17, 1964. Wolfgang Reinhardt of Germany made it over 16′ 6¾” (5.05 meters), one of two final competitors, out of the 32 who started. His compatriots, Klaus Lehnertz and Manfred Preussger failed on their three attempts, ending their competition at the 1964 Tokyo Olympics. Then Hansen made a gutsy decision. He decided to pass at 16′ 6¾”, and go for 16′ 8¾” (5.1 meters). If Reinhardt makes it at that height and Hansen doesn’t, the tall Texan would not only lose the gold medal, he would be the first American ever to not win gold in the pole vault. Even worse, having passed on two prior heights Lehnertz and Preussger had already made, Hansen’s gamble put him at risk of falling to fourth! To Hansen, all he was doing was saving his energy for the biggest vault of his life. At the time, pole vaulting competitions would commonly last three to four hours. But the finals of this Olympic competition was a marathon, starting at 1pm, and continuing late into the cool Autumn night. Hansen told me the Olympic officials raised the bar at smaller increments than normal, he suspects, to enable as many vaulters to advance as possible. Through the preliminary round on October 15, and the beginning of the finals, the bar was raised 4 inches at a time (10 cm), but in the last seven rounds of the finals, the bar was raised only 2 inches at a time (5 cm). 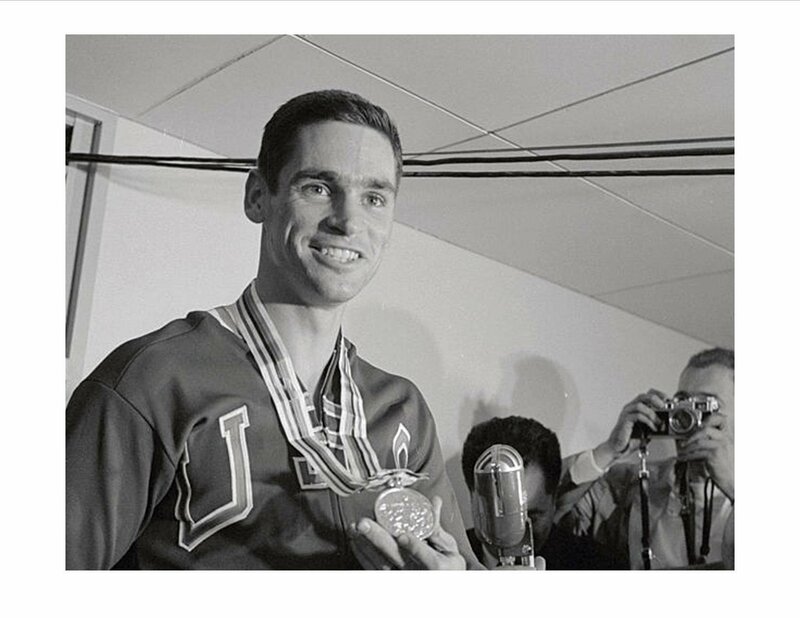 At the time of the Olympics, Hansen was the reigning world record holder at 17′ 1¾” (5.23 meters). It was becoming apparent that the long competition was not going to yield a new world record, but he knew his advantage was the need for fewer vaults. In fact, over the two-day competition, Hansen made a total of only 8 attempts out of a possible 31. Contrast that with the Germans Reinhardt, Lehnertz and Preussger who made a total of 15, 16, and 12 respectively. The pressure never really got to me in Tokyo, however. I knew there were certain things I had to do and if I did them right, I could win. The psychological side of vaulting is just as important as the physical side. I managed to keep calm, and that was worth a lot. So the bar was at 16′ 8¾” (5.1 meters). In the past 7 hours, Hansen had vaulted only 4 times. He had to stay loose, stay warm, and wait for his chance. Finally, in front of only a fraction of the spectators who filled the stadium at the start of the competition, under the very bright lights, Hansen finally stepped up to the runway. Hansen’s approach on his gold-medal winning leap, from the book “Bi to Chikara”. To the cheers of the remaining Americans in the stands, Hansen runs, sticks his pole in the box, and elevates to the bar, but his chest just brushes against the bar enough on the way up to send it crashing to the ground. It’s Reinhardt’s turn. In a thin mist, the German runs and seemingly leaps high enough, but he taps the bar on the way down, sending the bar off the uprights. On their second attempts, Hansen hits the bar again on the way up, while Reinhardt again knocks the bar down on his downflight. Reinhardt is exhausted as he tries to extract himself from the plastic and foam rubber that fills the landing area. As he tumbles off, he sits on the ground for a moment, legs splayed, depleted. Hansen hit the bar on the way up his first two attempts as he thought he wasn’t getting his feet back enough on the launch. So on the third attempt, fully aware of the need to keep his feet back to create a tiny bit of separation between his body and the bar on the way up, he launches himself into the air, and cleanly over the bar. Reinhardt has one more chance. But it is not to be, as his feet hit the bar on the way up, ending the long day’s journey into night. Hansen wins gold, setting an Olympic record, and ensuring America’s continued Olympic dominance in the pole vault.